Metropolitan Pump played a major role in restoring a venerable landmark to its former pumping glory. Chicago’s Buckingham Fountain is a stately symbol of a handsome city rich in history and a lake front that offers beautiful vistas and lively sources of entertainment for city residents and countless visitors alike. Constructed in 1927 as a monument to the World’s Fair, the Fountain is renowned for its sweeping displays of water, particularly during the colorful night hours. Buckingham Fountain holds 1.5 million gallons of water and is capable of pumping almost 15,000 gallons of water a minute from its three pumps located in a control room beneath the fountain. Manufactured in 1926 with the largest standing over 6 feet high and 3 feet wide, these pumps have proven to be steady, substantial workhorses through the years. But, given time, even the best of workhorses will deteriorate, particularly when no major renovation has been performed on them, as was the case with the famous fountain. And having Buckingham Fountain run dry was unthinkable. 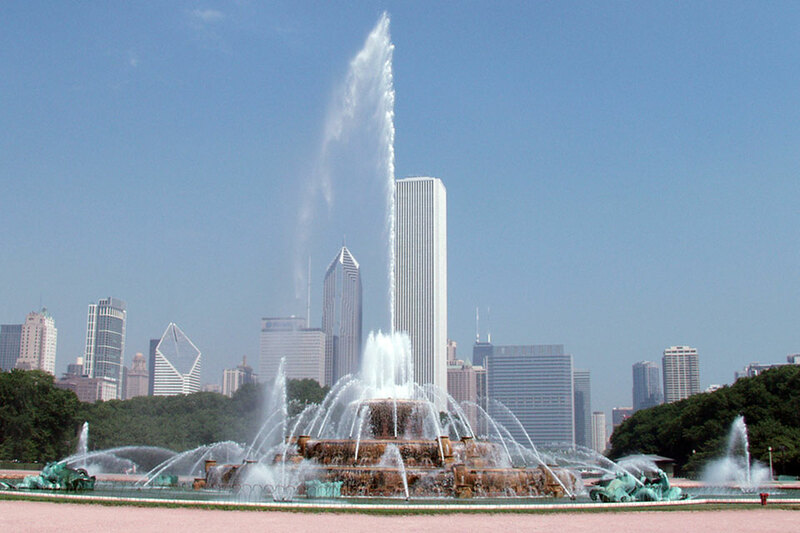 Based in part on our reputation for service and quality of which we are proud, we were contacted by the mechanical contractor with a decided challenge: the complete refurbishing of all three Buckingham Fountain pumps. Once Metropolitan Pump took command, the three pumps were removed as quickly as possible and transported to Romeoville. In order to meet the rapidly approaching dead­ line, we implemented work immediately by putting a machinist full-time on the job, the beginning of over three weeks of non-stop effort. Using original specifications and diagrams from the manufacturer and employing original materials such as brass and stainless steel, we re­ moved the three pump’s rotating units and totally refurbished them, Compounding the formidable task was the necessity of removing the pumps and transporting them to our Romeoville facility. Secondly, the required parts had to be re-manufactured because they were no longer available or could not be ordered in time to meet the deadline. For example, refurbishing the babbot bearings required the utilization of technology rarely used today. Molten metal was poured around the bearing castings to build up where the bearings had worn away. Then the bearings were machined round again to fit the shaft, which, it, was also re-machined, exactly following original specifications. After refurbishing, Metropolitan Pump personnel returned the three oil-lubricated pumps to the fountain’s control room, working efficiently within the confined space. The re­ installation went off without a hitch. Today, Buckingham Fountain continues its captivating aquatic traditions, thrilling generation after generation of sightseers.